I created this thread to collect all New Scientific, Concept and Futuristic Technologies which is not related to the HW/SW or aftermarket components or products, so it will not interfere with the other main topics. It will cover all industries, not only the computer one. I'll ask moderators to move my old related threads in "Off Topics" section to this thread, to make it a dedicated one for this kind of news and discussions. Hope that everyone like the idea and I'll be happy to see your contributions. Optical transistors, using photons instead of electrons, promise to one day be more powerful than the electronic transistors currently used in computers. Agarwal’s research on photonic computing has been focused on finding the right combination and physical configuration of nonlinear materials that can amplify and mix light waves in ways that are analogous to electronic transistors. “One of the hurdles in doing this with light is that materials that are able to mix optical signals also tend to have very strong background signals as well. That background signal would drastically reduce the contrast and on/off ratios leading to errors in the output,” Agarwal explained. To address this issue, Agarwal’s research group started by creating a system with no disruptive optical background signal. To do that, they used a “nanobelt”* made out of cadmium sulfide. 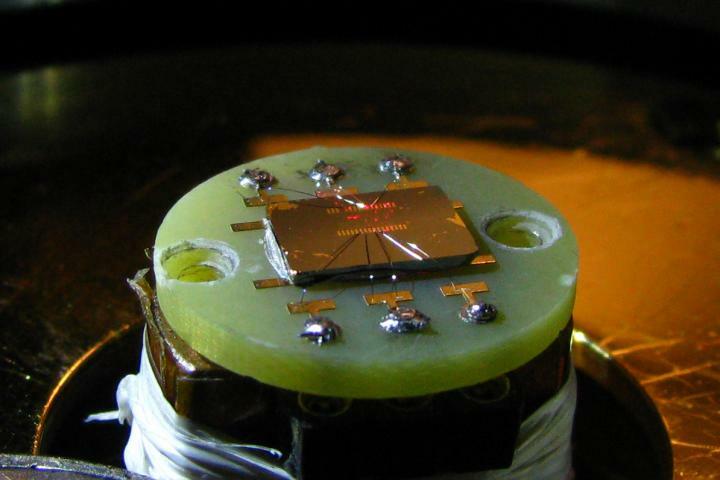 Then, by applying an electrical field across the nanobelt, the researchers were able to introduce optical nonlinearities (similar to the nonlinearities in electronic transistors), which enabled a signal mixing output that was otherwise zero. The next steps toward a fully functioning photonic computer will involve integrating optical circuits with optical interconnects, modulators, and detectors to achieve actual on-chip integrated photonic computation. The research was supported by the US Army Research Office and the National Science Foundation. * “Made of semiconducting metal oxides, nanobelts are extremely thin and flat structures. They are chemically pure, structurally uniform, largely defect-free, with clean surfaces that do not require protection against oxidation. Each is made up of a single crystal with specific surface planes and shape.” — Reade International Corp.
** That is, the system was capable of precisely controlling the mixing of optical signals via controlled electric fields, with outputs with near-perfect contrast and extremely large on/off ratios. “Our study demonstrates a new way to dynamically control nonlinear optical signals in nanoscale materials with ultrahigh signal contrast and signal saturation, which can enable the development of nonlinear optical transistors and modulators for on-chip photonic devices with high-performance metrics and small-form factors, which can be further enhanced by integrating with nanoscale optical cavities,” the researchers note in the paper. Dynamic control of nonlinear signals is critical for a wide variety of optoelectronic applications, such as signal processing for optical computing. However, controlling nonlinear optical signals with large modulation strengths and near-perfect contrast remains a challenging problem due to intrinsic second-order nonlinear coefficients via bulk or surface contributions. Here, via electrical control, we turn on and tune second-order nonlinear coefficients in semiconducting CdS nanobelts from zero to up to 151 pm V−1, a value higher than other intrinsic nonlinear coefficients in CdS. We also observe ultrahigh ON/OFF ratio of >104 and modulation strengths ~200% V−1 of the nonlinear signal. The unusual nonlinear behavior, including super-quadratic voltage and power dependence, is ascribed to the high-field domain, which can be further controlled by near-infrared optical excitation and electrical gating. The ability to electrically control nonlinear optical signals in nanostructures can enable optoelectronic devices such as optical transistors and modulators for on-chip integrated photonics. “Our group has a mission to take the 3D displays of science fiction and make them real,” said electrical and computer engineering professor and holography expert Daniel Smalley, lead author of a Jan. 25 Nature paper on the discovery. The team’s free-space volumetric display technology, called “Optical Trap Display,” is based on photophoretic** optical trapping (controlled by a laser beam) of a rapidly moving particle (of a plant fiber called cellulose in this case). This technique takes advantage of human persistence of vision (at more than 10 images per second we don’t see a moving point of light, just the pattern it traces in space — the same phenomenon that makes movies and video work). What about augmented and virtual-reality uses? “While I think this technology is not really AR or VR but just ‘R,’ there are a lot of interesting ways volumetric images can enhance and augment the world around us,” Smalley told KurzweilAIin an email. “A very-near-term application could be the use of levitated particles as ‘streamers’ to show the expected flow of air over actual physical objects. That is, instead of looking at a computer screen to see fluid flow over a turbine blade, you could set a volumetric projector next to the actual turbine blade and see particles form ribbons to shown expected fluid flow juxtaposed on the real object. 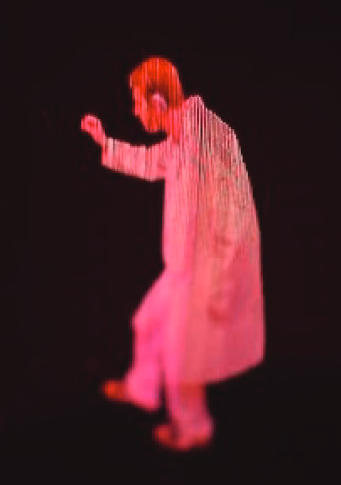 * Smalley says he has long dreamed of building the kind of 3D holograms that pepper science-fiction films. But watching inventor Tony Stark thrust his hands through ghostly 3D body armor in the 2008 film Iron Man, Smalley realized that he could never achieve that using holography, the current standard for high-tech 3D display, because Stark’s hand would block the hologram’s light source. “That irritated me,” he says. He immediately tried to work out how to get around that. Free-space volumetric displays, or displays that create luminous image points in space, are the technology that most closely resembles the three-dimensional displays of popular fiction. Such displays are capable of producing images in ‘thin air’ that are visible from almost any direction and are not subject to clipping. Clipping restricts the utility of all three-dimensional displays that modulate light at a two-dimensional surface with an edge boundary; these include holographic displays, nanophotonic arrays, plasmonic displays, lenticular or lenslet displays and all technologies in which the light scattering surface and the image point are physically separate. Here we present a free-space volumetric display based on photophoretic optical trapping that produces full-colour graphics in free space with ten-micrometre image points using persistence of vision. This display works by first isolating a cellulose particle in a photophoretic trap created by spherical and astigmatic aberrations. The trap and particle are then scanned through a display volume while being illuminated with red, green and blue light. The result is a three-dimensional image in free space with a large colour gamut, fine detail and low apparent speckle. This platform, named the Optical Trap Display, is capable of producing image geometries that are currently unobtainable with holographic and light-field technologies, such as long-throw projections, tall sandtables and ‘wrap-around’ displays.